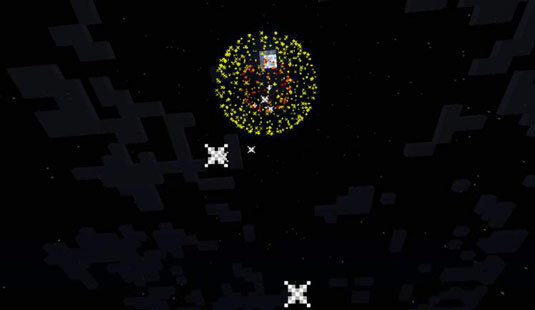 Did you know you can create your own firework show in Minecraft? In addition, you can totally customize the type of fireworks used, the effects, colors, duration, height, shape, explosion, etc. There are two ways to accomplish this. You can either learn how to make fireworks by collecting resources and crafting the various firework recipes available or by using custom commands (coding) to customize and start the firework sequence. Craft the firework star by combining a dye with gunpowder in your crafting grid. It’s important to note that items other than dyes, like a head, nugget, feather, or fire charges will also work and create a different explosion effect. Craft the firework rocket by combining your firework star with 1 piece of paper, and 1 gunpowder in your crafting grid. You can use up to 3 separate pieces of gunpowder, each additional item will shoot the firework higher into the sky. Shoot your firework rocket into the sky. Simply point up and click on the firework item in your inventory to shoot it into the sky! Another way to light up the sky with fireworks is to use commands to generate a firework show. The Minecraft firework item tag structure is one of the more complex ones in the game due to the various tags that can be applied. However, fireworks can produce many custom particle effects, and unlike with the particle command, you can customize their colors and other visual settings. Colors: A list of every color to appear in the firework. Every color is represented by an integer. FadeColors: This is just like the Colors tag, except that it determines all colors that the original colors fade out to as the firework dissipates. For example, you could make a blue-and-green firework that fades into yellow and green near the end of the effect. Flicker: Equal to 1 if the explosion has a twinkling effect. Trail: Equal to 1 if the explosion has a trailing effect. Type: A byte representing the sort of blast you’re creating. 0 is a small ball (default), 1 is a large ball, 2 is a star, 3 is in the shape of a creeper face, and 4 is an upward burst. This command summons a firework that explodes after one second, creating a twinkling yellow outer layer and a red-and-orange inner layer that fades into the same yellow. You can also program Firework Stars in this way, using the Explosion tag (which contains the compound for a single explosion) instead of the Fireworks tag.